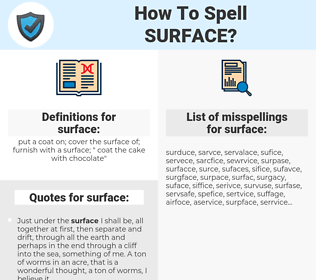 What are the misspellings for surface? What are the common mistypes for surface? What is the definition of surface? What are the usage examples for surface? What are the quotes for surface? 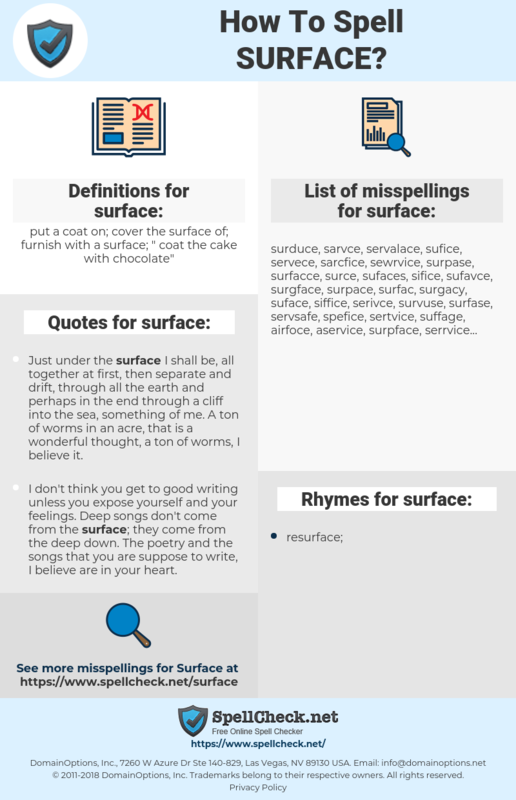 What are the rhymes for surface? What are the translations for surface? What are the common typos for surface? This graph shows how "surface" have occurred between 1800 and 2008 in a corpus of English books. 表面, 地表, 表面上, 表层, 水面, 外面, 皮面. superficie, surgir, couche, émerger, surface. belegen, Decke, auftauchen, Belag, Außenfläche, Oberseite, an die Oberfläche kommen, mit einem Belag versehen, hochkommen, pflastern. 表面, 面, サーフェス, サーフェイス, 上面, 上部, サーフィス, 浮き出す, おも, じょうめん, ちじょう, うわがわ, 浮び出る, 上っ面, うわ, 浮出る, 浮かび出る, 浮出す, ひょうそう, 外面的, うかびでる, 上辺, 浮き出る, うわつら, ひょうめん, うきだす, がいめんてき, 上側, もて. emergir, superfície, de superfície, terrestres, tona. поверхность, поверхностный, выныривать, всплывать, выниривать. salir, revestir, aparecer, piso, superficial, cara, de superficie, de la superficie, salir a la superficie, asfaltar, aflorar, pavimento.